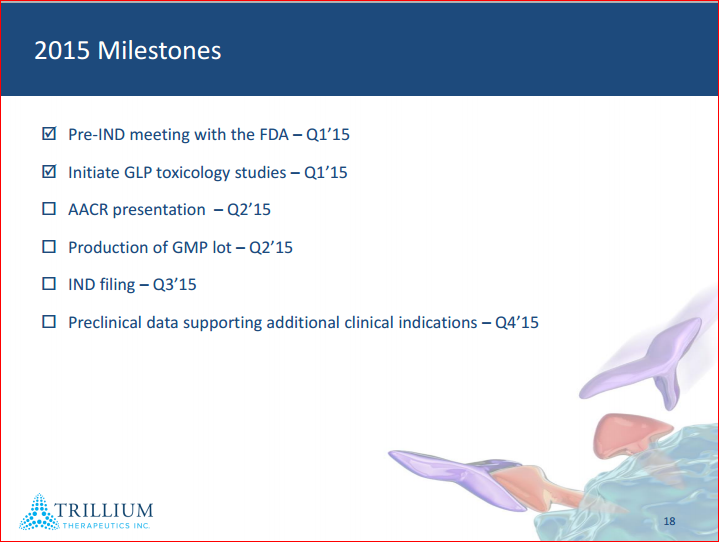 Trillium Therapeutics presented at Bloomburton-2015 Healthcare Investor Conference in Toronto on May 5th, the speaker Dr. Rob Uger, TRIL’s Chief Scientific Officer (CSO) was very informative during the presentation, mentioned that TRIL are looking for a combination therapy with other immunological agents such as Approved cancer antibodies, T cell checkpoint inhibitors (e.g., anti-PD-1) , Cancer vaccines, Oncolytic viruses or CAR T cells, TRIL will be evaluating SIRPαFc in preclinical combination studies. TRIL has broad clinical potential in both hematological and solid tumors. He replied that they are looking for a several combination, looking for combos with many companies and there are so many interesting options in the market, TRIL’s CD47 blockade can enhance the potency of anti-cancer antibodies and promote T cell responses, and would be great to see the enhancement to an approved drug. But they will inform the investor as soon as the decision is taken. A lot of eyebrows lifted after Dr. Eric Sievers joined TRIL as Chief Medical Officer (CMO), coming to a tiny Canadian biotech company from the higher league – Seattle Genetics, but he took his decision after looking in depth at TRIL’s potential, and the novel approach to blocking CD47, he is willing to bring breakthrough technology to market. Dr. Sievers brings a wealth of experience in the biotechnology industry, and expertise across multiple cancer indications including AML, myelodysplastic syndromes, Hodgkin and non-Hodgkin lymphoma, melanoma, and renal cell carcinoma, these day he is leading TRIL in evaluating and implementing the clinical development strategies for advancement and approval of the clinical programs. Q: What about partnership, any pharma companies interested. We have over a dozen companies interested in partnership, with some, we were in advanced talks, but we decide that we have to wait till we advance our program to the clinic, that will give us an advantage and will raise the potential of larger down payment and better deal condition. Some of those companies still in contact and interested in our lead product. We will choose carefully the partner that will bring us and our investor a real added value and help us to step up for the next stage. Q: What is the timeline to start the clinical trial. We already had a Pre-IND meeting with the FDA, and the IND filing is planned during the 3Q-2015, if we get the green light from the FDA, we are planing to start the Phase-1 clinical trial during the 4Q-2015, we will have several sites in the US & Canada, we already started looking for the trial sites. Disclosure: Author is long TRIL.